Quality Control – and Electrical Test in particular – has always been considered as the last “necessary evil” before the Printed Circuit Board can finally find its way to the impatient customer. Yet despite this unrelenting pressure on the QC-department, everyone somehow takes it for granted that the quality engineer will flawlessly and meticulously pin down any errors that may have slipped through the net in one of the processes upstream. His skill to correctly tell the good board from the bad is a pillar that carries a company’s reputation for quality. But unfortunately, it is not as simple as that. Nowadays, even the best of quality engineers cannot do without equally good tools, hardware and software. One risks costly test escapes by continuing to use antiquated and manual software. More productivity may be gained with a small investment in state-of-the art software than with a large investment in hardware. That’s where FixGenius comes in. Tests show that FixGenius’ rule-based probe-mapping algorithms reduce pin deflection by up to 25% compared with traditional fixturing packages. Lower deflection means easier assembly, a more reliable fixture, with shorter set-up time and higher first-time pass rate. Lower deflection can mean fewer guide plates; fewer plates mean shorter drill times. "FixGenius fixtures are cheaper and easier to run"
FixGenius regularly finds a single-density fixturing solution where previously double-density was needed, or a single-pass solution where previously two fixture sets were needed. If a solution is mathematically possible, FixGenius’ algorithms will find it, and pick the one with least deflection. If the job simply cannot be done with one single fixture, FixGenius will fully automatically split the test into multiple fixtures or into fixture and flying probe test sets, with guaranteed test integrity. It will find ingenious solutions were other packages would fail. If you have a choice of testers, fixture-styles or pins, FixGenius allows you to prioritize them and will then consistently pick the most economical solution, based on your parameters. When you have more and more density problems, you should investigate smarter software before you invest in higher density testers. "FixGenius protects your investment in grid testers"
No matter how complex the job is, it is a mere matter of minutes before the test solution is ready. Automatically. FixGenius automated functions save you hours of laborious editing. Qualified Ucamco staff will review your workflow and set up FixGenius accordingly. They make absolutely sure that every aspect of the test process is covered and that you are getting the maximum out of your available equipment. All this is done off-line prior to installation. FixGenius highly automated functions reduce training to a minimum. "Minimal disruption of the day-to-day test floor operation when the system is introduced. A remarkable boost in productivity"
"You retain full control of the fixture you will build"
FixGenius is totally open. It uses communicates with the data preparation front-ends upstream and with the testers and verification stations on the shop floor downstream via standard IPC-D-356 formats. FixGenius is compatible with all common grid testers and fixtures styles. A highly configurable output processor outputs ready-to-use data for your drills and routers. FixGenius is designed to work with front-end data preparation software from all vendors. "FixGenius will handle your workflow, your grid tester, your fixture styles and your drill shop"
FixGenius checks incoming data for completeness and flags all inconsistencies to avoid that bad data results in wrong fixtures being built, or, worse, flawed tests performed. Run-time production checks verify that the fixture can be drilled, that the board can be transported automatically, and that the board can be tested. (Examples: Is the test pins size correct for the head shape? Is the test pin not conflicting with the cutoff required on the top plates? Distances ok? Breakout ok?) You are guaranteed a fixture that can be used industrially. When all conditions for a valid run are met, the actual fixture generation is set off with a simple mouse click. The technology is derived from over 25 years of experience of daily building fixtures in our test centers. The process is governed by vendor-specific rules defining the fixture, and job-specific rules selected by the customer. 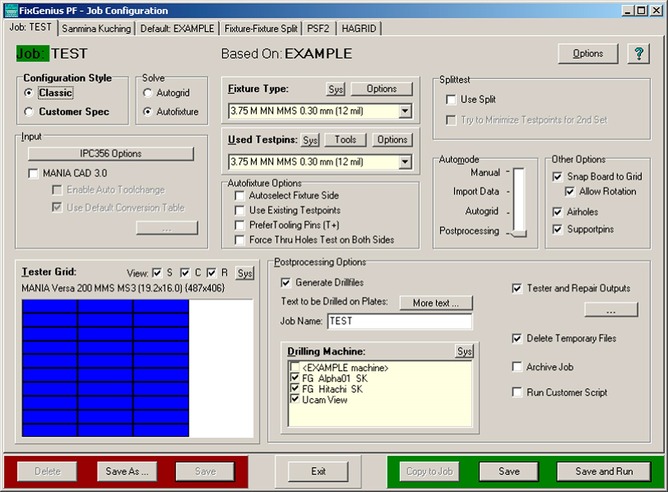 This unique approach, together with FixGenius’ fixture-building knowledge base embedded the package, ensures that every operator – novice or experienced – will produce correct and consistent electrical test tools. Regardless of the hand driving the mouse. "Avoid test escapes due to poor data, or operator errors"
Ucamco can supply you a complete range of Electrical Test software. You can bundle FixGenius with Ucam SmartGrid to handle to whole workflow starting from CAM files to building fixtures, or add Ucamco world-class FaultStation for fast fault-location.